Thank you, Pastor, for the blessing you are to God’s people in your call to shepherd the congregation through Word and Sacrament ministry. God has blessed you with unique gifts to employ in His service. What better time to utilize these shepherding skills than with a VBS that teaches Psalm 23. Intentionally show your support for VBS. Pastors who share the mission and ministry of VBS with their congregation create a VBS culture that glorifies God and serves others. Use VBS as an entry point for service. Be alert for people serving in VBS whom God may be calling to service in other ministries. VBS has been the starting place for leaders in all areas of service in God’s Church! Help VBS Leaders set goals for VBS that align with the mission of the congregation. A goals worksheet is provided on the Director CD. Ask your Director for all the digital files referenced in this Overview from the “Pastor Helps” folder on the Director CD. Initiate and include VBS in your worship planning. 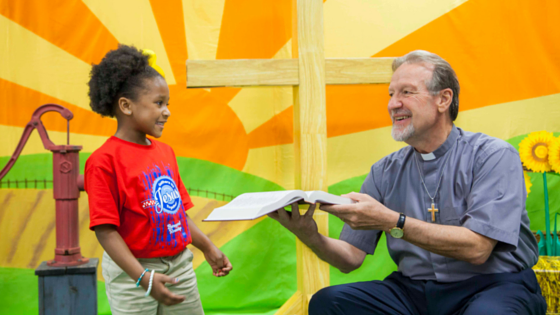 Make announcements on the importance of VBS, introduce your congregation to the theme, and designate a Sunday as the volunteer commissioning service. Again, your continued support of VBS creates a culture in your congregation that values this ministry. Pray for your VBS Leaders, and be available for support. It’s a blessing for people to know that their pastor will listen and keep VBS focused on a godly purpose in the midst of all the details. Lead and encourage your VBS Leaders to choose curriculum with care. In Barnyard Roundup, every lesson clearly distinguishes between God’s Law and His Gospel. Children (and their leaders) learn God’s will for their lives and how the Law has been fulfilled for them in the person and work of Jesus Christ. At the center of every lesson is the Gospel: God’s gracious gift of Jesus as the Savior from sin, death, and the devil. Prepare VBS Site Leaders and Team Leaders to share the Gospel with kids and parents. Page 3 of the Pastor’s Overview offers a how-to for sharing the Gospel. Another Gospel-sharing resource using the Take-Home Points is included on the Director CD. Request lists of visiting kids and families, and reach out to them with a personal invitation to attend worship, midweek services, and/or seasonal events. Commit to monthly follow-ups (by yourself or designated church leaders) with those who are unchurched to find out any prayer needs and share invitations to special events. Making contact with them during VBS is a great beginning for witness. Make a plan for how to respond to ministry, disciplinary, or emergency needs discovered during VBS. If your VBS Director is a volunteer, your support is imperative when dealing with sensitive and potentially litigious issues. Prepare the whole church to provide a warm welcome to VBS families who may visit worship or attend other activities after VBS. Discuss an assimilation plan and have it ready for possible future members.